No one wants to find themselves in the middle of a budget blow out during any kind of service- but when it comes to electrical work, your budget may just dictate exactly what can and can’t be achieved, so it’s vital to stick with your plan. In this article, we aim to explore some of the ways you can save money where you need to, and how to communicate effectively for great results. Be clear about what you need, using both forms of verbal and written agreements on anything non-negotiable or worthy of follow up. Don’t do the guess-work! Ask your questions and don’t feel apprehensive about needing to know more! It’s your money, time and property. Refer to your tradespersons’ expertise for ideas. You’ll find that many of us are a wealth of interesting and creative input for your plans. Ask for the ‘cooks tour’ once the work is complete. This will help you to understand all the aspects of the work and how to maintain or treat the project on completion and into the future. Keep in mind that your approach to having work done doesn’t change in accordance to the size of the project being carried out. Truth be known, you won’t necessarily want a written document for a couple of electrical outlets to be installed, but you may want to mark out the perfect spot for them, or have your technician talk you through a range of suitable options that cansave you time or money down the track. Talk openly with your service provider about the way in which they charge. If offered an hourly rate, be sure to break it down into a transparent quote. If at any stage, you’re unhappy about the amount or can’t see evidence that the suggested amount adds up, don’t settle. Either a) ask for a breakdown or b) find an alternative service provider who will charge you based on a fee-for service approach. Good Communication is the Key to Getting the Best Result. The essential aspect here comes down to a professional approach from both parties involved. The client must feel respected and as though they can easily approach and ask as many questions as they need to without feeling they’re asking for too much. At Cidec, we believe in forming great lasting references with our customers. 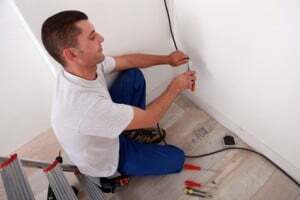 We know you appreciate having a trusted electrician on hand when needed, and it’s important to us. The right person for the job will demonstrate a noticeable level of courtesy and respect in your home, and will treat it with the same level of care they do with their own- to experience this for yourself, call our team at Cidec in Melbourne today.